The year 2017 was a special year for Christians because it marked 500 years from the recorded start of the Reformation in Wittenberg, Germany. The Reformation was the second great schism in Christianity led by a protest against the manner in which the Catholic Church was being run.. But 500 years before that the Great Schism of 1054, when the Greek Orthodox Church officially split with the Catholic Church had also split Christianity. Speaking on the Reformation, German Bishop Heinrich Bedford-Strohm, had said, "It was an act of liberation when, 500 years ago today, the Augustinian monk Martin Luther posted his 95 Theses in Wittenberg, perhaps even a few meters from here, on the door of this church,"
The bishop is chairperson of the Council of the Evangelical Church in Germany and had delivered a sermon at the Oct. 31 service at Wittenberg's Castle Church. "A spiritual renewal went out from Wittenberg, to people in Germany, Europe and worldwide. To men and women from all social classes," said Bedford-Strohm. The events set in motion by Luther's 95 Theses led to the separation of Western Christianity into Roman Catholic and Protestant churches. However, "Luther did not want to found a new church but to call the Church of Jesus Christ back to its Lord," said Bedford-Strohm. The Reformation pitted Roman Catholics and Protestants against each other for centuries embroiling them in many bloody wars in the name of their confessions. But today Christians understand that the church must not longer be divided, said the bishop. "No one should think that we can be induced to stray from the path towards visible unity in reconciled diversity," asserted Bedford-Strohm. The anniversary was a chance for Lutherans and other Protestants and Catholics to grow close together. In July Pope Francis had hailed the signing of declarations by the World Communion of Reformed Churches joining Lutherans, Methodists and the Catholic Church to affirm their basic understanding of the Gospel in the quest for greater church unity. "Together with great joy, today's formal act brings new challenges and responsibilities in our pursuit of fidelity to the Gospel and unity in truth," the Pope said in message read out for him. "May it mark a new stage of fellowship and cooperation in the service of justice and peace in our human family," said Francis. Toward the end of the year in a symbolic act, the Vatican issued a postage stamp to commemorate the 500th anniversary of the Reformation. The series went into circulation on Nov. 23, depicting the crucified Christ in the foreground. Kneeling at the foot of the cross are Martin Luther holding the Bible and Philip Melanchthon with the Augsburg Confession. The background shows a timeless view of the city of Wittenberg, where Luther nailed his 95 Theses to the door of the castle church in 1517, launching the Protestant Reformation. The Vatican's description of the stamp cites the Lund commemoration when Pope Francis held special prayers with Lutherans in Sweden in 2016. It refers to call by Pope Francis to remember the important event "with a renewed spirit and in the recognition that Christian unity is a priority, because we realize that much more unites us than separates us." The Lutheran World Federation welcomed the gesture by the Roman Catholic Church as "a wonderful expression of how far we have come together in our journey toward unity." The LWF General Secretary Rev. Martin Junge referred to the Oct. 2016 Joint Catholic-Lutheran commemoration of the Reformation in Lund. He said, "I believe this stamp speaks powerfully to reconciliation and the healing of memories between Catholics and Lutherans. We are today at a point where we receive each other gifts as we jointly confess Christ as our Lord and Savior." 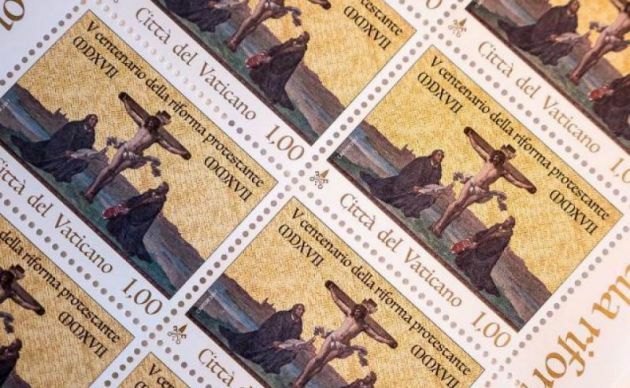 The Vatican issued 120,000 of the Reformation stamps.